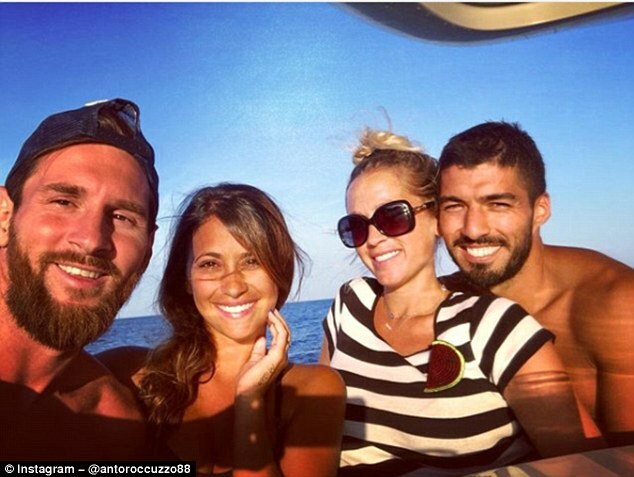 Barcelona superstars, Lionel Messi and Luiz Suarez have been spotted at the sea having an awesome time with their partners. There is no doubt that Lionel Messi and Luis Suarez are just as close off the pitch as they are on it. The two men were seen enjoying some time off following the 3-0 victory againt Alaves on Saturday, as they spent time with their partners. Messi's wife Antonella Roccuzzo and Suarez's wife Sofia Balbi were also present as they relaxed by the sea. While Suarez may not have been able to get on the scoresheet against Alaves, the Uruguayan did tee up Messi's second goal of the game, which made it 3-0. Philippe Coutinho also found the net for Barcelona, who are determined to retain the La Liga title and also make a major impact in the Champions League. Next up for Barcelona is a trip to face Real Valladolid on Saturday, and both Messi and Suarez will be eager to score in that fixture.